April is weird. So is baseball. Combine the two and you’re left with many, uh, interesting results. This article will focus on some of baseball’s hottest breakout pitchers and whether their April success is a sign of a true breakout or just noise. I decided to only look at pitchers whose starts to this season are drastically different from their previous career results. Because of this, there will always be some regression involved due to the magnitude of their early success and the small sample size. But, this should not take away from changes that are deemed to be real and have long-term implications. 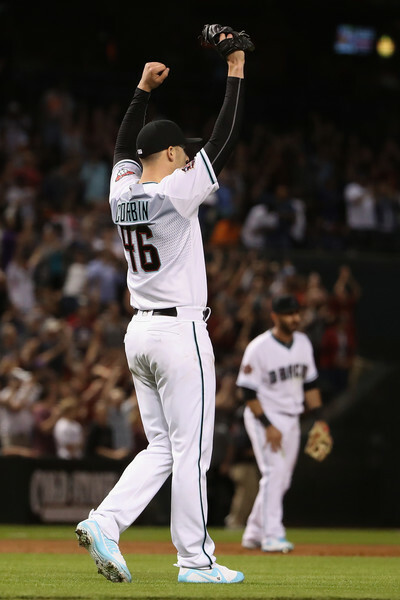 So far this year, Patrick Corbin’s numbers have been more Chris-Sale-esque than Chris Sale’s. He is third baseball with 55 strikeouts, has a 2.25 ERA and 0.75 WHIP, and has performed like a real ace. Prior to this year, Corbin had some good and bad stretches but was viewed as a mid to back of rotation starter. His career ERA is over four and K/9 is around 8. Corbin’s best pitch has always been his slider. It begins on the same plane as his fastball and is very hard to tell apart from his fastball for hitters. Beginning last year, he has begun using this to his advantage and throwing it more. After a strong finish to 2017, he has continued to increase his usage of the slider this year, and it has not lost its effectiveness. Another interesting add-on to Corbin’s 2018 pitching arsenal is a slow curveball. He has stopped throwing his changeup and began throwing a curveball that is over ten miles per hour slower than his changeup. The curveball is not a devastating pitch, but it is an interesting way Corbin has successfully kept hitters off guard this year. Despite all this, Corbin is still due for some regression. His other pitches aren’t strong enough to continue this level of dominance. It would be reasonable to expect him to wind up with an ERA in the low-to-mid three’s and a strikeout rate closer to 9 K/9. Corbin certainly seems to have stepped up his game and should continue to have a strong season. He is having a career year (and is in a contract year), so enjoy the ride! Johnny Cueto’s ERA is below one. I repeat, Johnny Cueto’s ERA is below one. After a career-worst campaign where he put up a 4.52 ERA, it appeared Cueto’s long run of greatness was over. But it’s now May of 2018 and Johnny’s swiveling mechanics are still very much alive. 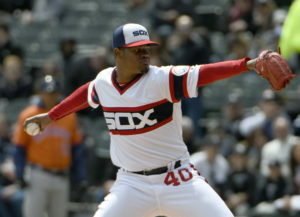 Reynaldo Lopez has always been a very intriguing pitching prospect known mostly for his electric, upper-90’s fastball. While his strikeout potential has never translated the MLB due to the lack of a stand-out secondary pitch, he seems to be tapping into some of his pitching potential early this season. With a 1.78 ERA, Reynaldo is among the league leaders in ERA and has put together a nice start to the season. While I would love to see Lopez succeed, I am not buying his early success. His biggest change from last year is a new slider he developed. This offering has been a helpful out pitch against lefties and has been part of the reason for his drastic improvements. However, the problem is that he’s now walking a batter every other inning. If he can’t stop walking so many batters his ratios will most-certainly swell. His FIP is almost three points higher than his ERA at 4.51 and regression should not be too far off. Lopez’s early-season success has shown us a glimpse of the upside he could bring, but his inflated numbers are bound to come crashing down soon. Mike Foltynewicz has never had an ERA under 4.30 across a full season. However, he has been impressive so far this year and certainly possesses the upside to keep it up. He currently has a 2.53 ERA, 1.22 WHIP, and 10.97 K/9 ratio. The flame-throwing righty features an upper 90’s fastball and has always been a strong strikeout pitcher. While Foltynewicz’s numbers this year aren’t as eye-popping as some of the previous names, they are still drastically different from his previous seasons’ numbers. So, what’s new here? Well, Foltynewicz has used his power-sinker much less this year and thrown more off-speed pitches in its place. His main secondary pitch, the slider, has been utilized more this year and has been much more successful in retiring batters. His slider has slightly less vertical drop on it than in previous years, but there is really not much that has changed between the past few years and now for him other than luck. Seeing that he is also walking more batters this year, I think his string of luck is due for an attack from the regression monster. Foltynewicz seems to get off to a hot start every year, and there’s no reason to believe this hot start will end any differently than his previous ones. After a strong 2016 debut, Sean Manaea struggled mightily in 2017. In a season where he battled various physical impediments, Manaea put up a 4.37 ERA and a 1.40 WHIP. This year, Manaea’s accomplishments include no-hitting the Red Sox, a 1.03 ERA, and a league-leading 0.62 WHIP. A large contributor to Manaea’s excellence this year is his health. After getting out to a strong start last year, Manaea hit a wall in July and his numbers blew up. This was caused by weight loss induced by prescription pills for an unrelated disorder. His velocity was down, he struggled with accuracy, and was just flat-out weak. This year, Manaea has his pill dosage under control and is once again strong and healthy. Manaea throws three pitches: a fastball, changeup, and slider. In the past, Manaea has relied on his off-speed pitches, but his fastball has been his best pitch this year in terms of runs above average. This is in large part due to his increased control with his fastball this season. Manaea is amid a breakout campaign. His ERA and WHIP are sure to rise from their current outrageous levels, but a full season ERA in the low threes is a realistic expectation. It is easy to forget how good of a pitcher Hyun-Jin Ryu was in 2013 and 2014. After a lost season to a torn labrum and an underwhelming few years following his return, the hype surrounding Ryu had substantially diminished. This year, Hyun-Jin has looked like the Ryu of old with a 2.22 ERA and a 0.84 WHIP. He is also striking out more batters, with a K/9 rate hovering around 11. Trevor Bauer had an extremely impressive second half last season and has carried that high-quality performance into this season. When looking at his last 18 games, including last season, he has a 2.43 ERA and a K/9 rate above 10. These levels of production are elite and could make Bauer a potential dynasty ace if he can continue to pitch this well. Bauer has undergone two large changes to get to this point, and I think he is here to stay as one of baseball’s top pitchers. The first of which is throwing more strikes. While his control early this season has not been as good as it was to end last season, he has still shown much better command of his pitches than before his recent hot streak. He’s never going to be the type of pitcher who rarely walks batters. However, with his stuff, sometimes it is better to be sensibly wild to keep hitters guessing. He can get away with missing locations from time to time and get chases. The second huge change, and what I feel is the most important of the two, is the slider. Before this season, Bauer had solely relied on his curveball (which is a nasty pitch) to get most of his strikeouts. After his fastball and curveball, he lacked an effective third pitch. His cutter and changeup were the same speed and got hit around if he did not locate them well enough. Late last year, Bauer developed a slider and started throwing it more often. This offseason he committed to improving the newfound pitch and has thrown it even more this season. The slider is a very effective pitch for Bauer because it is a different speed than his other off-speed pitches, has great movement, and generates a lot of swings and misses. 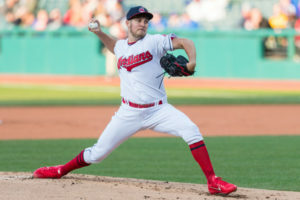 Adding this second whiff pitch to his arsenal has helped Bauer take the large step towards fulfilling his potential and becoming a high-end MLB starter. After a rookie campaign that saw him put up an ERA above six, Nick Pivetta has been one of this year’s more surprising hot starts. Through six starts, he has a 3.27 ERA, 1.12 WHIP, and a 9.3 K/9. If he could keep this up, those numbers would be extremely valuable to dynasty owners who gave the 25-year-old a second chance after his woeful 2017 output. Pivetta is an interesting case, and I’m not entirely sure whether he is going to stick around as a quality starter or not. However, I really like what we have seen from him so far this year. One of the biggest changes for him has been the increased usage of this best pitch: his curveball. Pivetta has thrown his curve more this year, and it has yielded good results. His curve and slider have shown improved depth this season and helped him get strikeouts. Although his fastball has solid velocity, it gets hit around. The increased usage and enhancement of his curveball has lead to less hard contact this year and therefore fewer hits. Another glaring difference is his increased control. His walk rate has been cut in half and he is not struggling with his control at all this year. With his increased effectiveness and decreased wildness, Pivetta has certainly improved in 2018. The question is whether he will be able to sustain his good control without losing effectiveness. 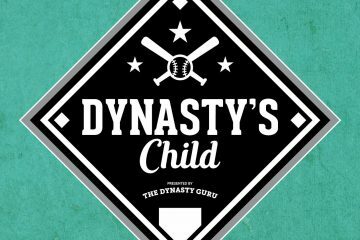 Eddie is a life-long baseball fan and fantasy baseball player who recently began writing at The Dynasty Guru to spread his insight on these passions. He is an avid Yankees fan and is extremely excited to watch them play this year.